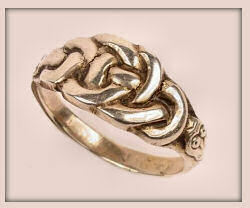 Very rare early napkin ring with knotwork and interwoven beasts decoration. Assayed by Saunders and Shepherd for Alexander Ritchie prior to the latter's full registration with Chester in 1910. Markings are CS * FS, AR IONA, and Chester hallmark for 1909. 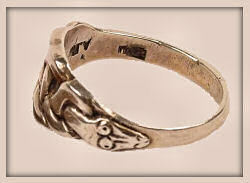 Unusual and beautiful 'serpent design' silver finger ring by Alexander Ritchie, marks are AR IONA and ICA with Birmingham hallmark for 1936. 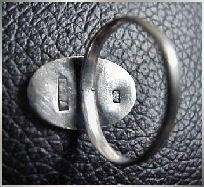 Rare silver finger ring by Alexander Ritchie from late 1910s - early1920s. 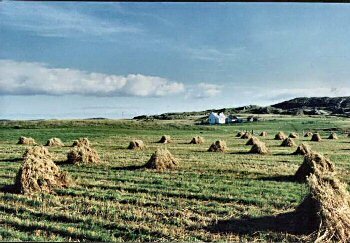 Separate recessed marks of AR and IONA. The carnelian or pale orange-brown Scottish agate central stone almost certainly came from one of Iona's beaches, as A.R. was a great believer in using local materials. 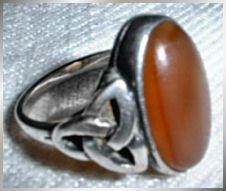 Other early rings by him are known with green Iona marble cabochon insets. 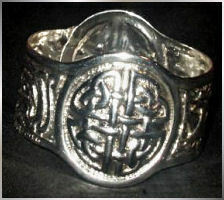 Unusual silver napkin ring by Alexander Ritchie. 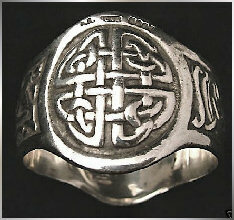 Has signs of earlier hallmarks but the main one is for Glasgow 1930, as well as impressed AR and recessed IONA stamps. Diameter is 4.5cms. 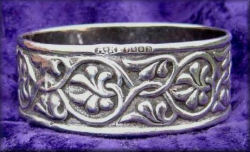 Beautiful solid silver napkin ring, diameter 5cms, height 2cms, hallmarked for Glasgow 1930 and also AR IONA. 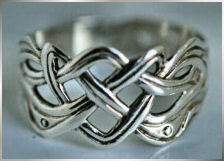 The foliate design is more often seen on the large annular plaid brooch (see under 'Annular Brooches' secion of this site). 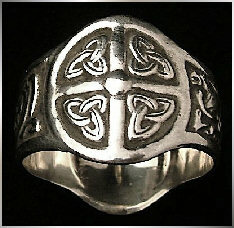 The design is taken from medieval Iona stone carvings. A fine and unusual piece. 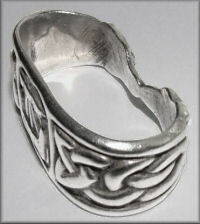 Very attractive ovoid silver scarf ring, with a longship as the central motif, and knotwork panels ending in terminals depicting ancient Celtic beasts similar to those found in the Book of Kells. Hallmaked for Glasgow 1929, with AR and impressed IONA marks. Maximum diameter 1.5". 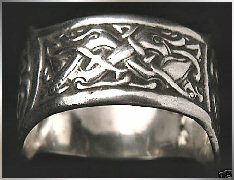 Very attractive silver finger ring by Alexander Ritchie, the design being a longship taken from MacKinnon's 8th medieval cross shaft on Iona. 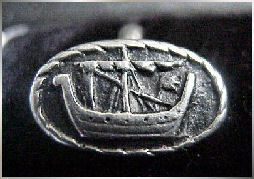 Reverse has recessed marks of AR and IONA. No hallmark; from the period c.1920. 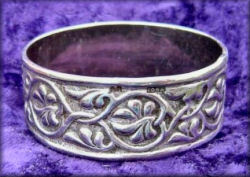 Fine heavy circular Alexander Ritchie silver napkin ring with enclosed knotwork patterns on either side, between edges of interlaced mythical animals taken from medieval Iona stone carvings. One end marked AR IONA and a hallmark for Glasgow 1921.